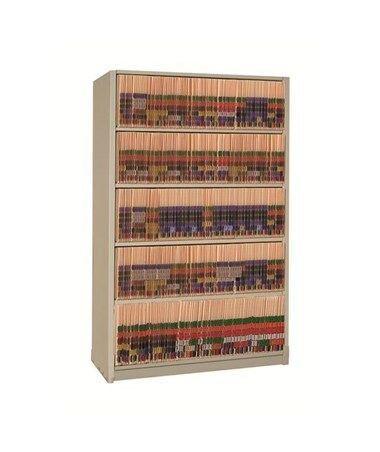 Unit Width: 24", 30", 36", 42" or 48"
The uniquely customizable Datum 4Post™ filing system offers maximum efficiency and flexibility, with customization and expansion options to handle the medical filing needs of virtually any medical facility. Configurable and Versatile: The versatile 4 Post™ provides organized storage of items of any size or weight while keeping them easily accessible. Its configurable modular design allows you to "grow as you go" - begin with the Starter unit, then select Add-On units to accommodate your facility's storage requirements as needed. This flexible shelving system is easy to install and works well with TrakSlider and MobileTrak moving shelving systems. With pre-punched tops and single rivet bottom shelf supports, it easily attaches to these mobile systems without the need to drill additional holes. 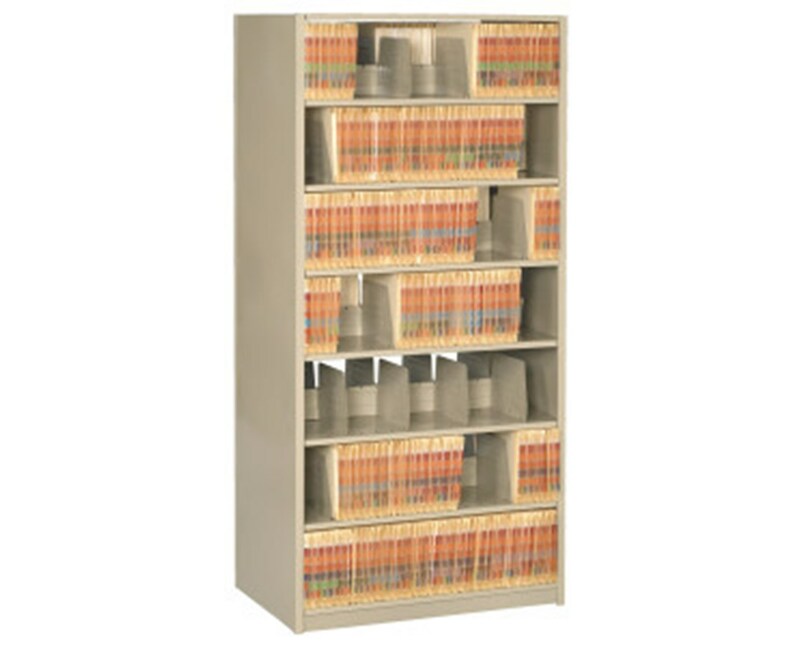 Durable: The shelves are made of 22 gauge cold-rolled steel with a 3/4" flange on all sides for additional support. The units are powder-coated for a durable, corrosion-resistant finish. Easy Assembly: The units are super-easy to assemble. Shipped knocked-down and bulk-packed, all shelf units are ready to assemble without the use of nuts, bolts, clips, or special tools. Model: This model has a height of 64-1/4” and a capacity for 4-6 tiers. It is a Double Entry Starter Unit. Double Entry - there is access to the files on both sides of the unit, as opposed to one sides (Single Entry units are available for purchase separately). It has a double-depth for back-to-back storage, with additional shelf reinforcements. This doubles the storage capacity of the unit. 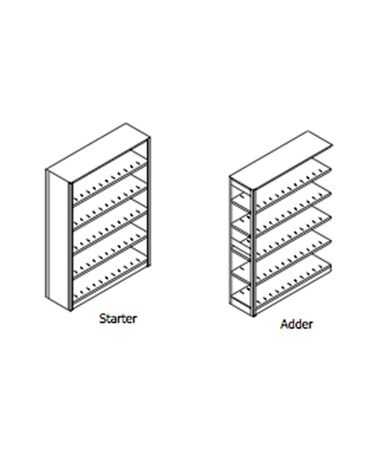 Starter Unit - it is designed to be a base unit that can be added onto at a later time with Add-On Units (purchased separately). The open “L” upright side post is typically used for row ends (for starter units), while Open “T” upright posts are used as a common upright between shelf units (add-on units). All uprights include a pair of pre-punched holes every 6" on the center, allowing a visual confirmation for correct shelf spacing. Shelves are placed on a 13" high base center. Please note: Dividers are not included with this product. You may purchase them separately from the Related Products tab above. The 4-Post Filing System comes with several customizable options in order to provide you with the perfect product that fits your specific needs. Select your preferences from the options shown above. Contact us for assistance with the many available customization options. You can choose between two depth options, corresponding to two media types; Letter or Legal. You can purchase a 4, 5, or 6 tiered unit. Prepunched tops and single rivet bottom shelf supports ensure easy installation to Datum's TrakSlider and MobileTrak storage systems without the need to drill additional holes. Datum’s interlocking keyhole uprights are available in seven standard heights and custom heights to meet your exact requirements. A plethora of accessories available to customize your 4Post. Add magazine doors, drawers, ball and golf bag storage to help you fit any need. 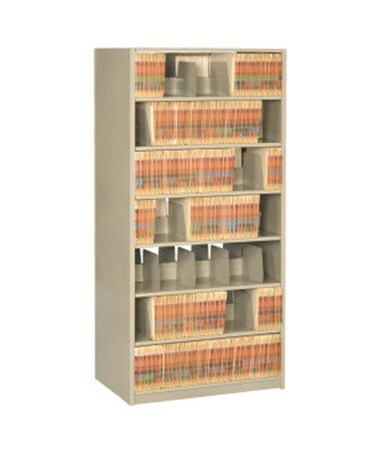 Adjustable on 2" centers ensuring documents remain secure, organized and easily accessible. Available for different industries and eight standard colors. Depth Letter: 24" / Legal: 30"